Freehub Oil is the original lubricant on the market specifically designed for Pawl style freehubs which require a lightweight lubricant. Freehub Oil performs consistently throughout a wide temperature range. “Flow Point” is -40 degrees, is extremely low friction, providing the greatest protection. 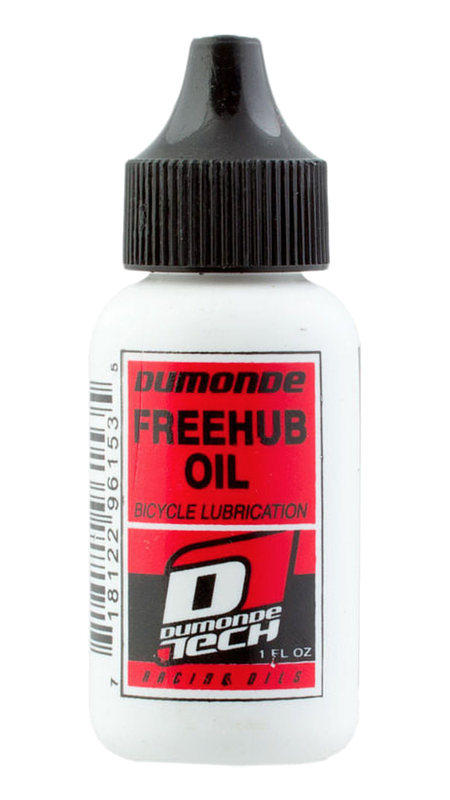 Simply follow the manufacture’s specification for the volume of oil required in your freehub body to experience the superior performance of Dumonde Tech’s Freehub Oil. Wide temperature range for consistent performance. Wide range of uses Can also be used to lube cables, brake levers and small parts. I used this oil to service my I9 FreeHUB and it works great. Will last you for a while. Awesome stuff, why take a chance. This is a necessity for pretty much any hubs using a pawl system, comes highly recommended by quality hubs such a i9 and Novatec, as the standard lubrication to use. Hubs are expensive, a blown out hub if infuriating and can be costly, both in time and money. Don't ruin your riding by not being prepared, take care of your quality hubs and they'll make sure you make it home every ride. What I needed but support lacked. I have been a Jenson customer for a while now and have spent a decent amount of money with them. I had an issue with the delivery on this order and called customer support. Very disappointed. I was surprised. Previously support issues were handled in a way that assured me that Jenson was interested in the long term and not the quick buck. No call back, no follow up., nada... My next purchases were from World Wide and Competitive despite Jenson having the lower prices. Is this really "pro x" Drumond Teck freehub oil as the bottle pictured? When i ordered it I recieved the "standard" Drumond Teck freehub oil. Can you confirm the description and the product picture are correct?